Hurrah it's the holidays and Nicholas and Rehema are back from Boarding School! What delightful young people they are and so confident. Flying the nest has been good for them, they're soaring! Now with all the children home we'll plan a day at the beach for a treat whilst everyone is together. Excitement abounded recently as all wanted to attend a blessing service for Paul and my marriage. The event was almost as big as our wedding day back home. Kenyans certainly know how to make noise and celebrate! The children sang worship songs in English whilst the Ladies Choir sang in Swahili. As with any wedding it is traditional to cook pilau, meat and potatoes so we had that afterwards which was enjoyed by 200 people in the village.....a rare treat! Plus cake donated by our volunteers. 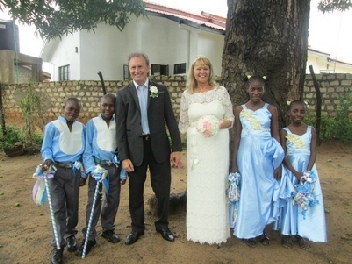 Mariamu and Monika were my bridesmaids and Kadenge and Dennis were Paul's page boys (see picture) All the Casuarina children accompanied us dancing down the aisle..... the African way! experience from the regular curriculum. 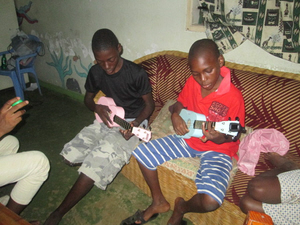 Staying at Casuarina greatly benefited our children too, they came with 6 ukulele's that were kindly donated. The boys in particular were keen to learn to play and some of them strummed Amazing Grace in Church on Sunday with the rest of the children accompanying them. Mary and Tina M had solo verses. See pic. of Right and Dennis practising beforehand. 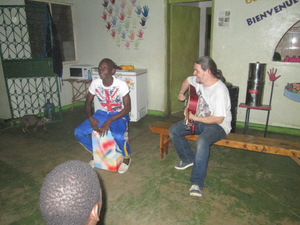 Their stay culminated in an hours concert Saturday night with all the children participating and showing off their musical skills. What talent there is amongst them! See picture of Bob on guitar having a jamming session with Manu on the Cahon. It's such a joy to see this nurtured in them. I think of all the 500 orphans on our feeding programme and others in the village and wonder what lies below the surface, what talents could burst out given the same opportunity. I'm sure there is much potential here and feel sad we can't explore this further right now. 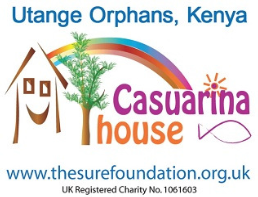 We feed the 500 children but would like to offer more. Saying that I'm grateful for the support we receive in being able to offer them some nurture. The regular food provides hope and a lifeline to so many. Our sad news at the moment is Right. You may remember he suffered a fractured leg in a football accident last year. We thought he was OK but has been in pain with recurring infections these last months. It seems the only remedy is to have an operation to remove the badly infected tissue and realign his bone otherwise he could eventually loose the use of his leg. He has broken up from School now so we are hoping to have enough funds to have it done in the holidays, it's an expensive Operation. Thank you for your continued support and words of encouragement. As ever.....Thank you, we are grateful for your support!